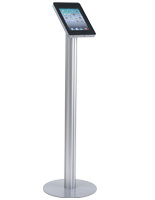 This tablet floor stand is ideal for any shop or tradeshow. 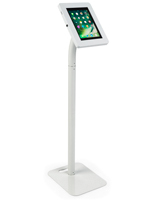 The white kiosk holds a variety of iPads and the Samsung Galaxy Tab 3 10.1” & Tab 4 10.1". 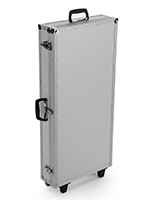 Adjust the ABS plastic enclosure of the floor stand for landscape or portrait orientation. 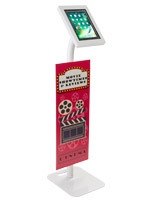 A hands free display is user friendly for shoppers or tradeshow guests that may be carrying other items. To charge the iPad in the floor stand simply feed the cable through the kiosk tube and out the base. 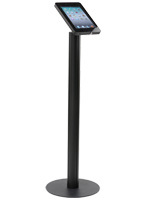 The plastic enclosure holds the iPad with foam supports for device placement and security. 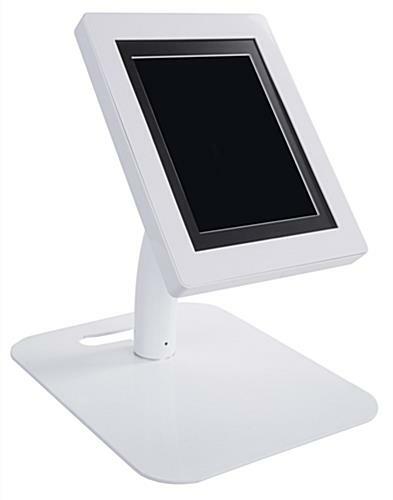 Adjust the hands free display to convert to a tabletop presentation by screwing the small curved pole to the base and removing the straight one. This product is clean and looks great. However, it is awkward, complicated, and time consuming to put together. Also, it is unstable and wobbles once put together. I would not buy this product again. In fact, I choose another product and am much happier. Sturdy and Easy to Assemble! I purchased two for our tradeshow booth. They were easy to assemble with clear instructions. 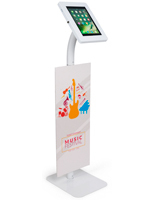 They are very contemporary and streamline which coordinates perfectly with our booth design. I like their sturdiness, so they will not be easy to knock over. The display is at a comfortable height for booth visitors to stand and view our presentation. The only issue I had was fishing the power cord through the tube. Our simple solution, tying a string around the cord and pulling it through, worked like a charm. 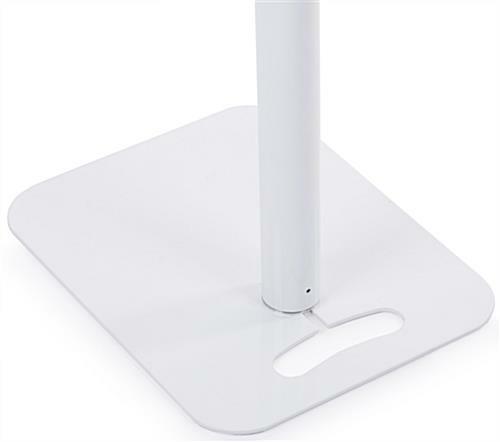 While we were optimistic that a $117 tablet stand would be sufficient for our needs, the reality is it's low price comes with limited quality in it's design -you get what you pay for. First clue was with the housing bezel, very cheap plastic that feels as if someone could pry the iPad out with very little tension just with their fingers. Once we set it up, it looked just okay -not great. But once we started using it, that's when we noticed that when typing on the surface it vibrates and wobbles to the point that it's distracting to the user. Yes, we double checked the tension on all the bolts/screws. Hi Joe, we're sorry that the iPad stand didn't live up to your expectations. A customer care specialist will reach out to you to discuss your experience. 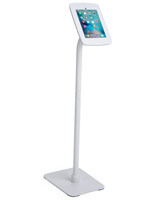 I did not like these iPad stands at all. The base was great- all steel and very supportive. However, the iPad casing was terribly designed. It was all a very cheap plastic housing. 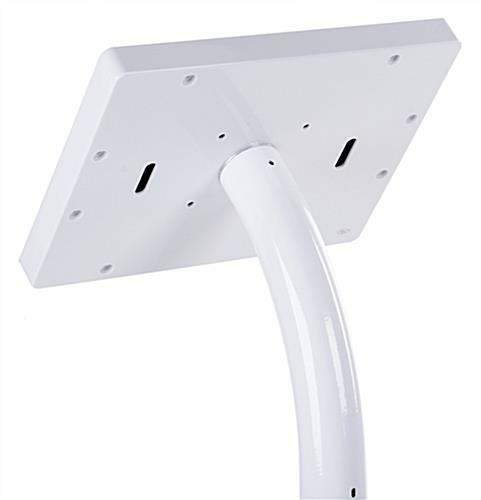 You can secure it by screwing in 8 screws from the back, as well as by popping it into place. However, once popped in, it is very difficult to pop back out. I thought I was going to break it, because again, it is all cheap plastic. 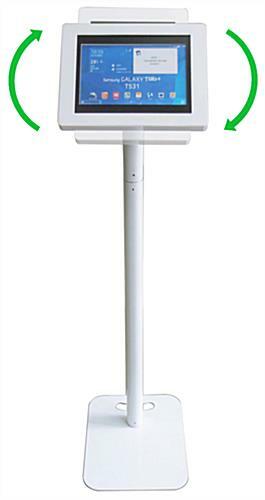 Also, the advertisement says it can be a floor or counter stand. However, there was no way that I could figure out to mount the base to the part that would make it a counter stand. I was very disappointed with this purchase, and returned it within the week. Why make the iPad housing out of cheap plastic? Why advertise both floor and counter ability when it is not. Very disappointed. Hi Wes, We're sorry you were disappointed in your purchase. We're always trying to find ways to improve our products so feedback is so helpful and important to us. We've sent your feedback to our team of customer care specialists and they will reach out shortly to discuss. Thank you! I have this set too. The plastic cover you can use a little more strengh to pop back it won't break. The cover have to be tight otherwise the tablet not secure enough I think. And about turn floor to tabletop one you can just remove the straight tube and install the bended tube directly to base. It is also no problem. Hope my suggestion helps. Posted one year ago by Ron J. Thank you, Ron for assisting a fellow customer! You are correct about the tight fit and the installation for countertop use. We hope your stand is working out well for you. Thank you for the feedback, Allison!